Spoiler-free ZOOTOPIA movie review – Zootopia, “Where anyone can be anything!” Thanks to Mayor Lionheart’s Mammal Inclusion Initiative. Disney’s ZOOTOPIA should be a big hit for Walt Disney Animation. Continue reading for our full ZOOTOPIA movie review. Pictured (L-R) Mayor Lionheart, Assistant Mayor Bellwether. ©2016 Disney. All Rights Reserved. Disney’s ZOOTOPIA is a playful romp through the ultimate anthropormophic world. Animals talk, walk on hind legs, wear clothes, and have the same trials and tribulations humans do, even down to the pigeon-holing. Zootopia, a “modern mammal metropolis,” is made up of various ecoregions, including Sahara Square (desert), Tundra Town (where the polar animals live), Bunny Burrows (there’s a hilarious gag here), Little Rodentia, and others. Animals can move freely between regions, but, as with humans, each region has its own identifying characteristics – regional accents, clothing styles, etc. Disney animators researched the creation of Zootopia in four stages, starting at the Disney Animation Research Library, where they reviewed historical anthropomorphic Disney animals. The next stage was visiting a nature wildlife learning center to see live animals. For further research, they went to Disney’s Animal Kingdom. That wasn’t enough though so the animators were sent to Kenya. Disney’s commitment to realism in animation is impressive. Each animal in Zootopia was expected to behave and move as the animals do in real life, but modified for walking on two legs. Size, weight, and speed were all factored in to scale the animals accurately. 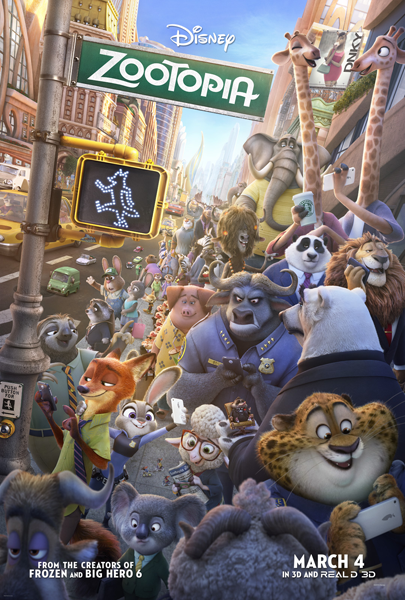 Some of the more fanciful test runs were included in Zootopia as background characters – keep an eye out for an elephant scooping ice-cream and a group/herd of wildebeest crossing the street. ZOOTOPIA – Train Station. ©2016 Disney. All Rights Reserved. ZOOTOPIA begins with school-aged Judy Hopps in a play that reveals to the audience (both play and movie) the history of Zootopia and how predator and prey animals came to live together peacefully. In fact, such a detente exists in real life, around the watering hole, which is reflected by a giant fountain in the center of Zootopia. Judy’s dream is to become a police officer in the city and she makes her dream come true by working hard and overcoming the obstacles presented by her size and her prey status (until Judy, all police officers were predators). Judy Hopps ©2016 Disney. All Rights Reserved. As a cop story, it’s pretty good. Judy’s first case is a good race-against-the-clock mystery with enough twists and turns to keep the adults interested, but not so many that children will be confused. Judy partners with Nick Wilde, an enterprising fox (inspired in part by Robin Hood) who has the opposite world view – he believes that people are who they are and should accept their limitations. These two characters are opposites in many ways and their interactions are hilarious and touching. Pictured (L-R): Judy Hopps, Nick Wilde. ©2016 Disney. All Rights Reserved. There will be no doubt about the primary theme of ZOOTOPIA; it’s repeated over and over as Judy’s mantra: you can be anything you want to be. Other themes include don’t let bullies get you down and don’t be restricted by how other people see you. My favorite, though, was that the easy idea isn’t always the right idea, so it’s worth doing the job all the way to make sure you get it right the first time. These are great messages for children and the repetition only verges on overkill for adults. It’ll be interesting for parents to see which characters their children identify most with and what they take away from the movie. ZOOTOPIA’s characters are played perfectly by their voice actors. Each brings an element of the animal personality to the voice. Ginnifer Goodwin and Jason Bateman voice Judy and Nick, respectively. I love that Kristen Bell was able to play a sloth, given her obsessive love for them (google “Kristen Bell and sloths” for some great videos that make Kristen Bell even more loveable than she is as Anna of Arendelle). The music is great – keep an ear out for classic hits and for fun sound effects like the doorbell in the Rainforest district. Gazelle, the Shakira of Zootopia (not coincidentally played by Shakira) has a hit number called “Try Everything” and it’s a great match for the message(s) of the movie. Her performance at the end of the film was great, except I was bit frustrated not to see more of her dancing tiger back-up singers. Only in Zootopia could a gazelle have tiger back-up dancers. SUPERSTAR — Revered worldwide by herds of fans, Zootopia’s biggest pop star Gazelle is a socially conscious celebrity with equal parts talent and heart. Shakira lends her Grammy-winning voice to the phenom. Walt Disney Animation Studios’ “Zootopia” ©2016 Disney. All Rights Reserved. My favorite character is Flash, a sloth working at the DMV (Department of Mammal Vehicles). His laugh (animated by Mr. Darrin Butters) is one of the best bits of the movie and his mug is perfect! When rookie rabbit officer Judy Hopps (voice of Ginnifer Goodwin) has only 48 hours to crack her first case, she turns to scam-artist fox Nick Wilde for help, but he doesn’t always have her best interests at heart. Their investigation takes them to the local DMV (Department of Mammal Vehicles), which is staffed entirely by sloths. Directed by Byron Howard and Rich Moore, and produced by Clark Spencer, Walt Disney Animation Studios’ “Zootopia” opens in U.S. theaters on March 4, 2016. ©2015 Disney. All Rights Reserved. Another favorite is Chief Bogo, a Cape Buffalo with a South African accent (if I’m not mistaken), who goes through his own personal journey throughout the course of the movie. As someone who’s been on the receiving end of a Cape Buffalo charge, I can tell you that Chief Bogo is an excellent representation. Pictured: Chief Bogo. ©2016 Disney. All Rights Reserved. ZOOTOPIA should be a big hit for Disney. ZOOTOPIA is fun, funny, referential, interesting, and, most importantly, believable. The internal logic is never compromised (a key element of a good story for me). Parents and children will both enjoy this and it’s good for all ages. There are a couple of moments that might be considered scary, but none of those moments last for long. I’m hoping, with all of my fingers and toes crossed, for a series of ZOOTOPIA sequels – movies, preferably, but I’ll take TV, too, if that’s how it turns out. For even more images, trailers, and printable activity sheets for Disney’s ZOOTOPIA, click here, and be sure to follow Adventures by Daddy on twitter and “like” our facebook page too for all our family movie news and reviews. thanks for including all of the extras with your review. The clips and activities are a nice bonus.